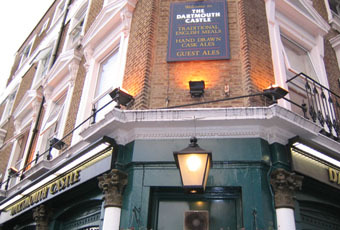 I visited here recently to go on a stag doo - a more mature affair than a hog/slog event so the ale was tasted and liked. Its not cheap and the service is strange rather than of lesser quality. I was fine with the night and only two brews to chose from and obviously with the food served as well then it seems to keep its trade. I'd go back. Took some friends out to dinner on Saturday and we had the most fantastic meal. This pub is so underrated and far exceeds restaurants charging a lot more. My guests had Duck confit and I had the Ribeye Steak and had a bottle of the amazing value Enamore wine (highly recommended to anyone visiting) - all in all - excellent food and superb staff made it a great evening. Without doubt the best pub in Hammersmith. Remarkably efficient pub, attractive staff and customers. Can't quite equate it with the rest of H'smith boozers. It's like it's a gateway to another dimension. One gripe - toilets. Bit small and intimate. Surprisingly quiet on a Saturday night, so the place had a very subdued atmosphere (not helped by the incredibly low lighting levels). Two real ales o, including a nice pint of Skinners' Cornish Knocker. Given how close it is to the centre of Hammersmith, it is certainly a civilised sort of place. This place is an oasis of calm in the chav infested hell hole that is Hammersmith. By far the best pub in the area, it is clean, friendly and well run. 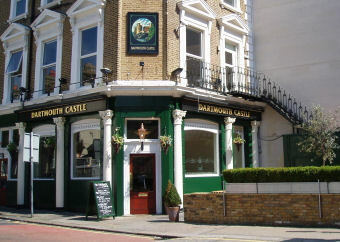 Part of the same chain that includes The Cumberland in Olympia and The Swan in Chiswick, this pub keeps up the great atmosphere that can be found in these other bars. I didnt try the food but others I know have and they highly recomend it. Fantastically chav free I would recomend this bar to anybody.